Scientific Name: Melospiza melodia graminea, sensu. The Santa Barbara Song Sparrow (Melospiza melodia graminea, sensu) is a now-extinct subspecies of song sparrow that was most closely related to the Channel Island Song Sparrow (Melospiza melodia graminea). There are 34 subspecies of song sparrows in the world: it is one of the most polytypic birds in North America, with a good deal of variation, especially in geographically restricted species. The Santa Barbara Song Sparrow resembled other similar subspecies and is described as most closely resembling the Heermann's Song Sparrow (Melospiza melodia heermanni). It was one of the smallest song sparrow subspecies and was characterized by a particularly gray back with dark streaks: Most song sparrows are browner in color with dark streaks. In general, a song sparrow's breast and belly are white with dark streaking and a dark brown spot in the middle of the breast. It has a brown-capped head and a long, brown tail that is rounded on the end. The sparrow's face is gray and streaked. The Santa Barbara song sparrows were distinguished from other song sparrows by a smaller, more slender bill, and a tail which was shorter than the wing. The Santa Barbara Song Sparrow was known to exist only on 639-acre Santa Barbara Island (The smallest of the Channel Islands) in Los Angeles County, California. In general, song sparrows are known to frequently forage on the ground and also in low vegetation where they are protected from predators by thickets and shrubs. Like other song sparrow species, the Santa Barbara Song Sparrow ate a variety of plant seeds and insects (including beetles, caterpillars, bees, ants and wasps, and flies). In spring, during the periods of nesting and rearing of young, insects increased in terms of the important components of the sparrow's diet. The year-round diet of song sparrows in California is 21 percent insects and 79 percent plants; the song sparrow also eats crustaceans and mollusks on the coasts. Based on extant species of song sparrows on San Miguel, Santa Rosa and Anacapa islands in the Channels, the Santa Barbara song sparrow built compact, open nests of twigs and other plant material, which were optionally lined with grass. The female laid three broods per season, each between two to six red-brown marked, pale green eggs. Incubation ranged between 12–14 days and was tended to by the female. Both parents were involved in the feeding until the sparrows were fledged, from 9–12 days later. The birds were serially and simultaneously polygamous, and DNA studies showed that 15 percent or more of the young were sired outside the social pair. In the first half of the 20th century, sparrow nesting habitat (scrub vegetation) on Santa Barbara Island began disappearing as a result of clearing land for farming and from browsing by introduced goats, European rabbits, and New Zealand red rabbits. Unnatural predation also threatened sparrows during this time, after the introduction of domestic cats to the island. The sparrow's natural predators included the American Kestrel (Falco sparverius), Common Raven (Corvus corax), and Loggerhead Shrike (Lanius ludovicianus). Even with these new challenges to its survival, the song sparrows maintained a viable population through the summer of 1958. Unfortunately, a large fire in 1959 destroyed most of the sparrows' remaining habitat. The birds are thought to have been extirpated from the island during the 1960s because years of intensive surveys and monitoring throughout the 1990s did not reveal any resident song sparrows on the island. The U.S. 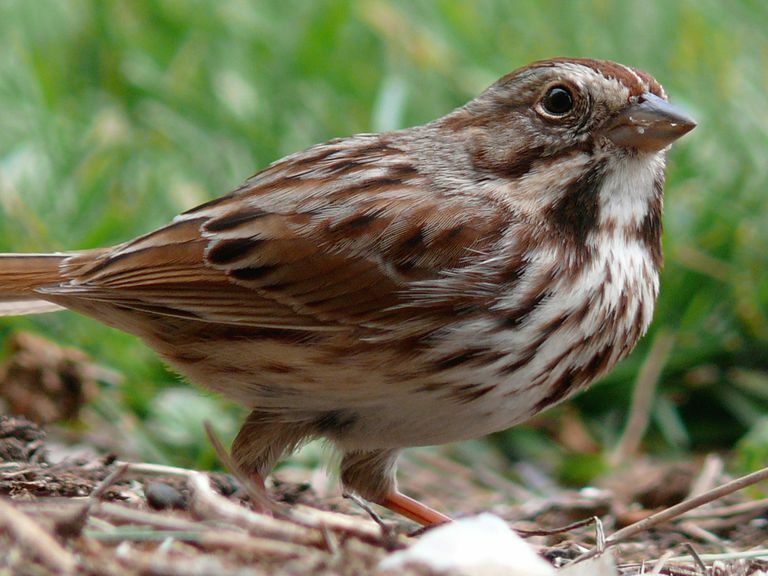 Fish and Wildlife Service officially determined that the Santa Barbara Song Sparrow was extinct and removed it from the endangered species list on October 12, 1983. According to the National Park Service, "The recovery of native vegetation, along with the removal of non-native predators, has aided in the reestablishment of nesting land birds [on Santa Barbara Island]. Today there are 14 land birds that nest annually on the island. Three of these, the horned lark, orange-crowned warbler, and house finch, are endemic subspecies found only on Santa Barbara Island. Unfortunately, the island's recovery did not come soon enough for the endemic Santa Barbara Island song sparrow. The destruction of this sparrow's sagebrush and coreopsis nesting habitat and the presence of feral cats led to the extinction of this species in the 1960s. This sparrow, which was found only on Santa Barbara Island and is now lost forever." Arcese, Peter et al. "Song Sparrow Melospiza melodia." Birds of North America: Cornell Lab of Ornithology, January 1, 2002. Van Rossem, A. J. “A Survey of the Song Sparrows of the Santa Barbara Islands.” The Condor 26.6 (1924): 217–220. Zink, Robert M., and Donna L. Dittmann. "Gene Flow, Refugia, and Evolution of Geographic Variation in the Song Sparrow (Melospiza Melodia)." Evolution 47.3 (1993): 717–29.